Walking into Alison and Geoff’s home, there was an immediate feeling of a sense of light and coziness. The light shining into their studio apartment, particularly through the orange blind in their bedroom added a touch of warmth. The walls in their home displaying artwork told meaningful stories of their travels to which it formed the perfect backdrop for their newborn family photos that morning, one day last autumn. Alison had got in touch with me to book a last minute newborn photography session. At the time, she had told me that her baby was due imminently and she wanted some memories of these early precious days. Between our emails back-and-forth, they booked their newborn photo session and tentatively put in a date in our diaries. As it turned out, their baby boy arrived nearly two weeks overdue and Alison got in touch soon after. When I arrived their 10-day-old newborn baby son was sleeping soundly in his cot. Alison and Geoff were both so easy-going and relaxed throughout their photo session, while I gently moved around and captured their beautiful connections with their baby. 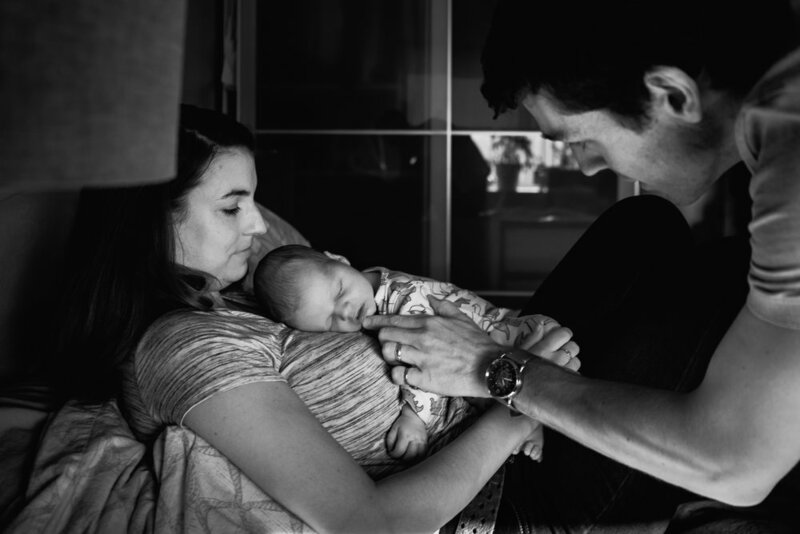 There is no need for posing during a documentary newborn session — we go with the flow of the baby and mother — which always makes these kind of sessions more authentic to you as well as being very relaxed. I took photographs of mother and baby nursing while Geoff watched on. Alison had said that nursing was a particularly special time for all three of them. They also wanted to remember this stage of how small their baby son was, as well as documenting the feelings of seeing his sleepy smiles, cuddles and the baby smell so they can remember how it felt when they look back in their photos.